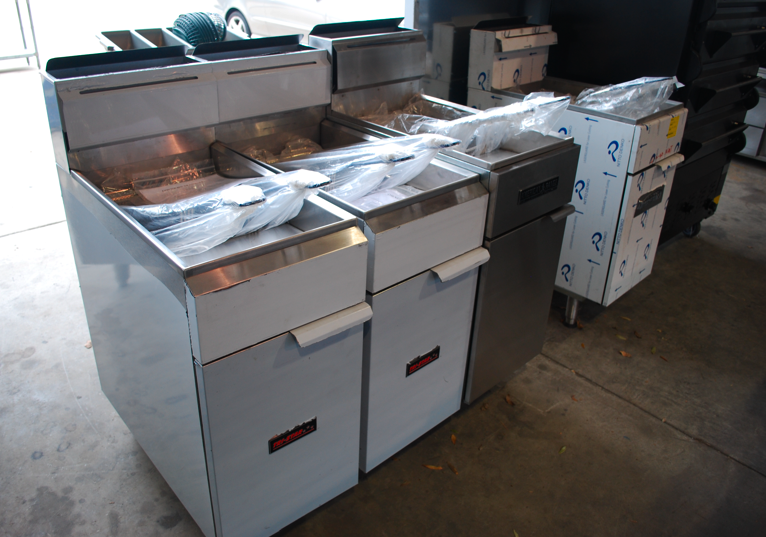 One Fat Frog Restaurant Equipment has a massive selection of used hot line restaurant equipment available for restaurants, bars, food trucks, vegan restaurants, etc. The One Fat Frog Restaurant Equipment Super Mega Warehouse in Orlando is filled to the brim with used commercial restaurant equipment with both hot and cold line equipment available. One of the most popular pieces of used hot line restaurant equipment available at One Fat Frog Restaurant Equipment is the used fryer. Whether you own a bar, restaurant, diner, food truck, etc., a fryer is an essential piece of restaurant equipment. Here’s some information o the key kitchen applications of fryers. Gas tube fryers are geared toward high volume frozen, fresh, and wet breaded products, high=production peak demands and large loads. Gas open-pot fryers are more suited to operations preparing fresh and frozen breaded potatoes and handling high-production peak demands and small to large loads, but these operations should also consider electric fryers. Flat-bottom fryers work best with foods that float, such as tempura foods, funnel cakes, and donuts; and wet-battered foods, such as fish. Pressure fryers should be used with high-volume, large-cut, bone-in chicken. If you are in the market for a used fryer, come into One Fat Frog Restaurant Equipment and check out the large selection of used fryers from brands like Imperial, American Range, Tri-Star, etc. One Fat Frog Restaurant Equipment welcomes quick cash deals and package deals towards the entire stock of used commercial restaurant equipment, including used fryers. One Fat Frog Restaurant Equipment also features an easy financing program – One Fat Frog Restaurant Equipment can get anyone approved no matter what shape their credit is in. One Fat Frog Restaurant Equipment offers more free delivery to more parts of Florida than any other used commercial restaurant equipment dealer. One Fat Frog Restaurant Equipment frequently delivers to Jacksonville restaurants, Tampa restaurants, Ocala restaurants, Gainesville restaurants, Daytona restaurants, Lake City restaurants, etc. One Fat Frog Restaurant Equipment also offers free gas conversion, free custom paint jobs, and free custom cutting boards. Come into One Fat Frog Restaurant Equipment today!